If you’re short on time, prepare calzone in advance, cover and refrigerate. When ready, brush with milk, sprinkle with Parmesan cheese and bake. Prepare a baking sheet pan with the cooking spray. Mix zucchini, onions and mushrooms with the reserved oil from the sundried tomatoes and spread on the baking sheet. Roast in the oven for 10 minutesor until browned. Reduce oven temperature to 400°F. 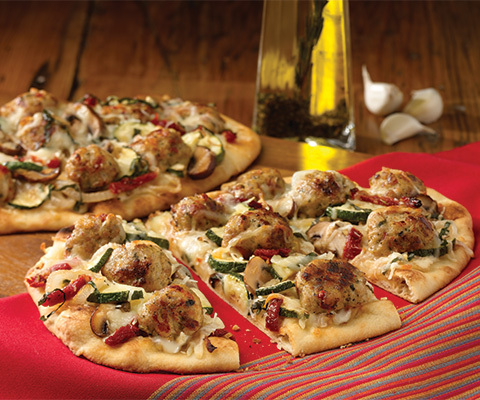 To assemble, spread Classico® Light Creamy Alfredo Pasta Sauce, followed by the roasted vegetables, basil, and meatballs (flat, face down) on each Naan, top with sun-dried tomatoes. Sprinkle with mozzarella and asiago, bake 10 minutes until the cheeses are nicely browned. Let sit for 5 minutes, slice and serve. If desired, add your favorite toppings such as sliced olives, hot pepper rings, roasted yellow peppers or sliced pepperoni. If desired, substitute Classico Caramelized Onion & Roasted Garlic Pasta Sauce with Classico Tomato & Basil Pasta Sauce.